VietNamNet Bridge - The centuries-old cinnamon gardens on Ngoc Linh Mount are a treasure which has been preserved for generations. Cadong people consider the ancient cinnamon trees as gifts from God. Hundreds of years ago, Tra My cinnamon was a precious produce offered to the Kings. However, dozens of years ago, the vast ancient cinnamon gardens were exploited massively for export for herbal medicine processing. The overexploitation depleted the cinnamon sources after a short time. In order to revive the cinnamon forest, the authorities called on locals to replant the forests with trees imported from the north which give high yield. Though the cinnamon trees grew rapidly, they did not bring high economic value because they had no attar. As a result, hundreds of thousands of people had to chop down the cinnamon brought from the north and plant indigenous cinnamon. The precious cinnamon trees have been saved from extermination and since then, they have been protected by Ca Dong and Mo Nong people. Pointing to the old cinnamon tree in Ong Ni hamlet of Tra Van commune, Bui Phi Lam, a local man, told reporters that there are many other old cinnamon gardens in his village, but they are located in the deep forest and it takes two hours to reach there. The centuries-old cinnamon gardens on Ngoc Linh Mount are a treasure which has been preserved for generations. 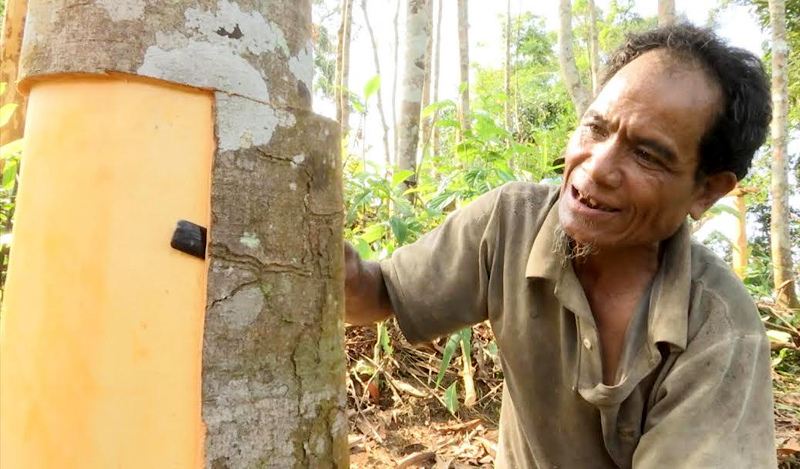 Cadong people consider the ancient cinnamon trees as gifts from God. There are about 40 households in Ong Ni hamlet. Like Xe Dang people who secretly grow Ngoc Linh ginseng in the middle of forests, Ca Dong people in Tra Van commune also grow cinnamon trees in the deep forests. After two hours of walking, reporters could see the ancient cinnamon forest. The biggest cinnamon tree has a perimeter of 2.5metres. There are hundreds of other trees with the diameter of 40 cm to 60 cm. “This is a precious tree which provides seeds. Many people came to ask to buy the tree, but people in the village decided not to sell it, because cinnamon is very important to Tra Van. It is the symbol of wealth,” he continued. Ho Van Dan, a village patriarch, said cinnamon trees are a part of local people’s life. Cinnamon trees are considered valuable assets transferred from generation to generation. Only when people need huge amounts of money for their important milestones in lives will they sell cinnamon. “Every household here has at least 500 trees, while some households have large forests covering tens of hectares,” Dan said.